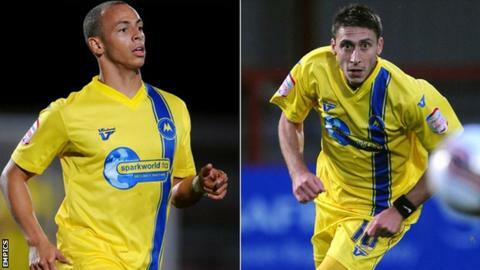 Torquay United have transfer-listed Lloyd Macklin and Chris McPhee. The strikers, who both have a year left on their contracts, have struggled to make an impact this season. Macklin joined Torquay from Swindon in June 2010 but scored just one goal in his career in a Johnstone Paints Trophy loss at Cheltenham last August. McPhee, who is 29, moved back to Plainmoor last summer from Kidderminster Harriers having played for Torquay in the 2006-07 season. Torquay boss Martin Ling said: "Chris has been transfer listed today and it is a case of looking at the balance of the squad, and I feel it would be best for him to move on. "For someone at the age of 29, Chris needs to be playing regularly and he is a squad player here. I feel it would be better for him to move on to a club where he is deemed to be a first pick." Ling added: "[Lloyd Macklin] has had five years in the game and nobody has really got the best out of him in that time. "He hasn't been consistent enough. He produces it now and then but he needs to learn the way of being of a footballer. "It is something he hasn't really grasped and I'm not prepared to try anymore, and that's why he has been listed. "Having said all that, if he comes back in the summer, I've never ostracised someone in my life and he will be given the chance to do pre-season training with us." McPhee scored the winner for Ebbsfleet against Torquay in the 2008 FA Trophy final at Wembley but has been unable to break into the Gulls squad since returning. He has scored twice in League Two but has only managed to start on six occasions in the league and has not played since 6 March. Macklin has managed just four league starts since becoming a permanent member of the Gulls squad two years ago. He spent part of last season on loan at Salisbury City and scored in their 3-1 loss at Sheffield United in the third round of the FA Cup.